Learn to use the Internet to find important information on cosmetic surgery procedures—and the right surgeon to do it! Hundreds of thousands are considering cosmetic surgery of some sort. The question is where can you go to find out what is right for you? The Internet Guide to Cosmetic Surgery for Women gives you the advantage of finding out everything you want to know about cosmetic surgery—from the comfort and privacy of your own home. This comprehensive resource guides you through the mountains of information on the Internet, providing a thorough listing of Web sites detailing every aspect of plastic and cosmetic surgery for every body part, as well as presenting strategies for finding specific information you are looking for. The Internet Guide to Cosmetic Surgery for Women gives you the tools to find information about a specific procedure, learn the surgery’s advantages as well as risks—even how to locate the best surgeons for the procedure. The book provides screen shots to illustrate Web sites, information on where to find the latest important statistics and data, and helpful definitions for cosmetic surgery terms. 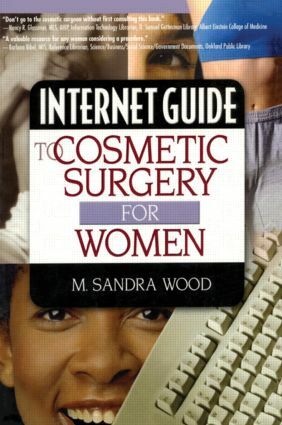 The Internet Guide to Cosmetic Surgery for Women is an essential guide for anyone interested in or considering plastic and cosmetic surgery procedures.